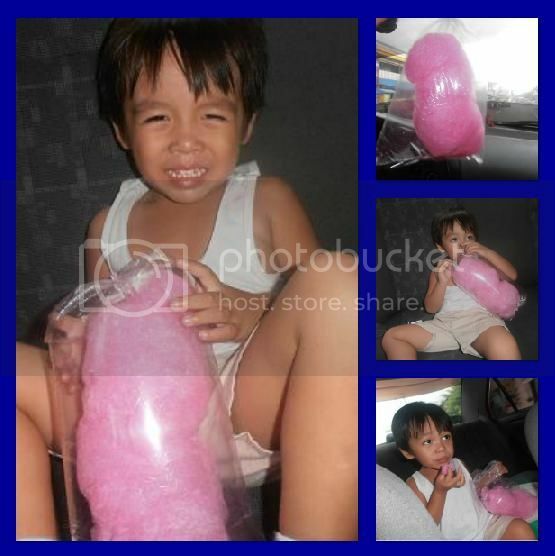 Cotton candy is very familiar to us especially to the children. Cotton candy is a typical serving on a stick or in the plastic. You can see the cotton candy during fiesta in the carnival or in the street. There are many flavors, including strawberry, lemonade, blueberry, lime, grape, orange, watermelon, pineapple mango, and many more. Although the latter is made with flour and water in addition to sugar. The food coloring can be used to change the natural white color. I bought one piece of cotton candy for Vince because while we going home, he saw the cotton candy on the road. And then he asked me to buy one for him. That time is fiesta in Lucena and the pedantic (peryante) in Lucena have many stores along the street or in the road. I took a photo while he eaten the cotton candy inside the car.